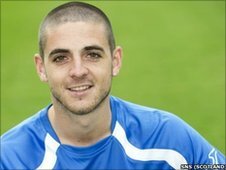 Blackpool have signed Scottish left-back Bob Harris on a free transfer after a successful trial. Harris becomes the Seasiders' fifth summer signing and joins after his contract expired at Scottish Division One club Queen of the South. The 23-year-old has signed a two-year deal with the option of a further year. He told Blackpool's official website: "I always wanted to come down here and give it a shot - I'd been at Queens for four years and needed a new challenge." Harris will provide competition in the left-back berth for experienced duo Stephen Crainey and new signing Matt Hill. Blackpool's new signing hopes to emulate the success of Stephen Dobbie, the striker who helped Blackpool win promotion last year and has returned there with Swansea City after leaving Queens. "I've got to say I really enjoyed those four years at Queen of the South," Harris told the Dumfries club's website. "It was a very special time in the club's history. "I particularly enjoyed the Scottish Cup final then playing in the Uefa Cup in Denmark - and even scoring in Copenhagen was a bonus. "I`ve kept in touch with Stephen Dobbie and, if I could only emulate his success south of the border, I'd be very happy." Dobbie wished Harris, who joined Queens from Clyde in 2007, well in his move to English football. "I think it's a great move for the 'wee man'," he said. "I've always phoned him on a regular basis and I wish him every success in his new career at Blackpool. "I was there myself and it's a nice place."